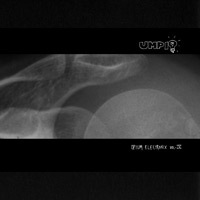 Umpio - "Opium Electronix Vol. IV"
Umpio means "vacuum" in Finnish. This is a project founded by Pentti Dassum in 2006. Pentti has been playing guitar and bass in a variety of punk, death-metal, rock, jazz and experimental bands since the early 90-ies, and also has a huge sound engineering experience obtained from working within the Finnish musical underground. However in his own project Umpio he devotes attention to making sounds from metal junk, contact mics, circuit bending, various analogue and digital electronics and whatever comes in his hands, recording extraordinary material from harsh noise to hypnotic ambient. The "Opium Electronics" falls right into the latter category. The first cassette "Opium Electronics Vol. I" was released by the Russian label Rokot in 2012, then two CD-Rs followed on Pentti's own imprint Nekorecords and now the fourth installment comes out on our label. Four tracks mold in a single sonic flow. Soft enveloping electronics that sounds like a plush cocoon wrapped around one's head. Background textures humming gently, waves of mild noises rolling softly, forefront sounds slightly scratching the ears... detachment and abstraction not providing any determined images but giving free scope to the listener's imagination. From Finland is Pentto Dassum, who works as Umpio and as such we reviewed some of his previous work - not me, but others. Dassum played guitar in many bands, ranging from punk, death-metal, rock, jazz and experimental since the early 90s, but as Umpio he doesn't use guitar but metal junk, contact microphones, circuit bending, analogue and digital electronics and whatever else. Apparently this could end up from anything noise based to hypnotic ambient, as the label tells us. This new release has four lengthy pieces, which seem to flow right into each other and making one piece. I guess Zhelezobeton selected to release this for it's more ambient nature. Not exactly of the kind of the other two, as Umpio is a tad more experimental and rough edged. But perhaps those are exactly the reasons why I like this a lot. It has mystery, it has tension, it is minimal yet engages to listen (more than Ogni Videniy) further; it has both a human and mechanical touch to it. Excellent release combining experimental and ambient. There’s an important lesson we all need to learn from Umpio through their fourth Opium Electronix, and that lesson is that you don’t have to use cover art and track titles that yell “We’re dark!” in order to sound dark. Umpio carries its own musical aesthetics when creating these four tracks, essentially adding all up to 47 minutes of scorched, blackened and burnt out fumes slow drones and bleak atmospheric expansions. I don’t know about the conceptual intentions behind this album, but it seems like the fourth Opium Electronix conjures some pretty disturbing and unsettling spirits through the list of summoning contraptions, namely feedbacks, radio, electronics, ‘Reactor’ extractions and tapes. What does it sound like? That’s a tough question, but you can get a general picture if you take a heavy rake and drag it on some rusted down amplifiers, defiling sacred shamanic ground. Sounds good? Umpio does it even slower, meaner, more complex and much better. Don’t miss this one! An existentialist listen in an increasingly existential world, Russia-based Umpio's meditative Opium Electronix Vol IV edition renders the meaning of life, meaningless. A cursory visit to the Umpio website proclaims, “There's no scene like no scene!”, now how existential is that? Or let us take the project name, Umpio, which means 'Vacuum' in Finnish, we are constantly directed to The Emptiness. Listening to this album is probably what being a part of the SETI Institute must be like, scanning the vast, endless heavens for an echo of a signal from some sentient civilization. Sure, you get the odd, random burst of radiation fluctuations, the flutter from a distant quasar, or probe signals bouncing off natural satellites. However, if you listen to deep space ambience long enough , you eventually get struck with the realization that whether there are other sentient beings or not is moot, we are all pulsing along with the Universe in unison, regardless of cognizance, a blip in the infinite. Opium Electronix IV is a live recording (in Finland) of a noise session by Pentti Dassum, the front man behind Umpio, culled from improvised feedback noise, electrical contacts, radio static, and tape loops, among other equipment. The results straddle the line between noise and ambient and what at first listen seems like empty static yields microcosms of life during deeper listens. These noises ebb and flow like tides against a cosmic shore with chirps and hums not different from crickets and other insects on a beach at night. A case where art unwittingly reflects nature, we are all a part of the void and the void is within us. A not unpleasant listen that facilitates meditative thought and deep insights. Radio disturbances had always been spellbinding for me since I was a little child. My grandfather had an old radio tape built inside a huge and fancy wooden box with mechanical rotating wheels for stations search and tuning, with hypnotizing soft yellow lights illuminating a strict front panel that lured me to turn the radio on and start a magical trip between the mysterious radio waves. I was always wondering what was the source of those disturbances and why there were so many of them. Little kids' imagination drew a picture of some kind of aliens or extraterrestrial signals which had been trying to transmit some important information. The only thing needed was to crack those codes and the one that would be able to do so, would have gained the ultimate power. More than thirty years passed since then, but I still remember this excitement and the old memories rise up each time that I hear the soft cracking of radio waves between the stations. To my big pleasure, I discovered a few years ago that there are people out there who turned those disturbances into some kind of a musical art finding a rhythm and an inspiration in seemingly chaotic signals. I believe that it is quite hard to craft something artistic from the wrapped and entangled electrical impulses, but with a little bit of an imagination, fine tuning and some additional special effects, they can turn into some fascinating pieces of electronic experimental music. Therefore, when I received the new album of Finland based artist Umpio released through the famous label Zhelezobeton, I stopped everything that I’ve been doing and connected myself immediately to the fresh and undiscovered material. According to different announcements from the label, this record should have contained a good portion of a manipulation with different abstract electronic sounds and after spinning the CD for several times I must agree with the statement – the soundscapes are totally abstract. As you might have understood, the result of such a creative approach demands a certain level of intelligence and a highly developed sense of an aesthetic perception. I am not sure that I do possess those qualities, but I must give myself a chance to discover whether it is right or not and that’s why I dive into the hypnotizing atmosphere of Opium Electronix Vol. IV with the opening track 'Circuito'. I begin to understand from the first minutes of this composition that the main emphasis was placed on continued background disturbances and this wide field of almost monotonous atmosphere prevails throughout the whole album. This soft noisy background is tempered by practically insignificant splashes of different scratches or electronic impulses, but the whole picture continues to stay the same, hypnotic to the level of a freeze point. All four tracks run in a continuous flow without any specific highs or lows to such an extent that I start to perceive this creation as some nebulous accompaniment losing any connection to a specific thought or vision. I easily miss passages between the tracks and the only thing that indicates a transition between them is a slight change of a tension and a tone. Regrettably and disappointingly, there is not much to add about the music itself except this short paragraph above. I expected the sound of this album to envelop me with some cocoon of electronic mysticism, but somehow it dropped into the field of a background hum without any specific thought behind it failing to set a closer dialogue with my abstract thinking. Maybe in another atmosphere, during the live performance with a video playback behind, this kind of an art could have sensitize me in some way, but this time I just missed the point.